Hendrickson is a common name that anglers have used to encompass both the species of Ephemerella invaria (also known as the Sulphur of Light Hendrickson) and Ephemerella needhami (Dark Hendrickson) because they are often found living in the same waters and emerging one after the other. Found across most of the Midwest and East Coast, the Hendrickson hatches span from May through June, and offer the fly fisher excellent action with both the nymph and dry fly! Our Hendrickson Mayfly selection has been purposefully crafted to cover the entire life cycle of both of these trout favorites! The Small Selection has a total of 12 Hendrickson Mayfly patterns and includes of 6 wet and 6 dry patterns. The Medium Selection has a total of 24 Hendrickson Mayfly patterns, expands upon the sizes, and includes of 12 wet and 12 dry patterns with some repetition in the most important sizes. The Large Selection has a total of 36 Hendrickson Mayfly patterns, ensuring that you are will be lacking for nothing during this prolonged spring hatch, and includes 18 wet and 18 dry patterns with repetition in the most important sizes. 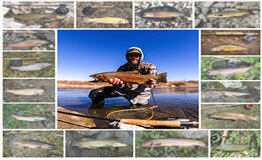 The focus of this fly selection is to hit the most important life stages for the fly fisher and the feeding trout. This fly selection does not include a box, but will be packed in a recyclable dish.